McKeesport, PA – Dr. Rachel Penney, O.D., is celebrating the grand opening of Penney Eye Care, located at 722 Long Run Road in McKeesport, PA, on Tuesday, Oct. 25, 2016 from 3 to 7 p.m. The celebration will feature refreshments and snacks, sales on glasses, great giveaways, and special guests. All current and new patients are invited to stop by to meet Dr. Penney and tour the office. Penney Eye Care offers comprehensive eye exams, children’s eye exams, emergency eye care, mana gement of ocular diseases like dry eyes and diabetic retinopathy, and co-management of pre- and post-operate care for patients having cataract and LASIK surgeries. Penney Eye Care also features designer eyewear frames, lenses, and optical services as well as contact lens services. The practice was originally owned and operated by Dr. James Letham for more than 35 years. Following a transition period with Dr. Penney, Dr. Letham retired earlier this year. The grand opening will also give patients the opportunity to wish Dr. Letham a happy retirement. 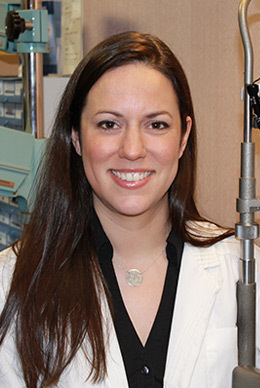 “I’m excited to meet people throughout the Mon-Yough Corridor and get to know them, just like Dr. Letham was privileged to do for so many years. I strive to give compassionate, thorough care to patients of all ages, and I look forward to creating lasting relationships with them. Sight and vision are so important to a person’s quality of life. I want to ensure that your eyes, and your family’s eyes, remain healthy,” said Dr. Penney, a graduate of the Illinois College of Optometry. During the week of October 24-28, there will also be special sales, including 50% off men’s, women’s and children’s select frames, 20% off prescription lenses, and 30% off sunglasses. Patients can also buy one discounted frame and get a second discounted frame for FREE if they purchase prescription lenses. When: Tuesday, October 25, 2016 from 3 – 7 p.m.
Dr. Penney and her staff treat patients in the Mon-Yough corridor, including White Oak, Elizabeth, McKeesport, North Huntingdon, West Mifflin, and the surrounding areas. Dr. Penney and her staff provide eye exams for all ages, and Dr. Penney strongly recommends children should start getting eye exams yearly by the age of three. They also provide care for eye conditions such as cataracts, lazy eye, and dry eye syndrome, and diseases including glaucoma, pink eye, and macular degeneration. Patients are welcome to contact the office at 412-751-5609 to set up an appointment for professional, compassionate vision care.